Taurus January 2018 Horoscope predicts that career activities will dominate this month with more than 80 per cent of the planets in the upper half of the horoscope. In this endeavour, you will be fully backed by your family as your progress brings overall happiness. During the month planets are changing over from the western half of the chart to the eastern half. Hence you have to give importance to both your social life and independence. Slowly the emphasis will shift to personal enterprise during the next month. Right now social grace is as much important as free will. Another aspect of life which will undergo important changes this month will be your spiritual life. The movement of Jupiter to your House of Spirituality on the 22nd of the month will force you to balance your spirituality with professional objectives. Career will be guided by spirituality and at the same time you will be actively engaged in philanthropic activities. The 2018 monthly horoscope predictions suggest that the solar eclipse this month will induce drastic alterations to your religious and spiritual beliefs. This is a period of self-awareness and you will explore the mysteries of self and the cosmos. Students will face turbulence in their academics with changes in institutions and courses of study. Career Horoscope for 2018 foretells that your focus on career may not yield the desired returns and you have to be patient. Follow a righteous course and allow things to happen. The only bright spot is that Taurus personalities will have the support of their family members in times of professional upheavals. Financial Forecasts for the Taurus zodiac sign indicate that January 2018 is not a favourable month for finances. Taurus personalities should go slow on their speculations and investments. 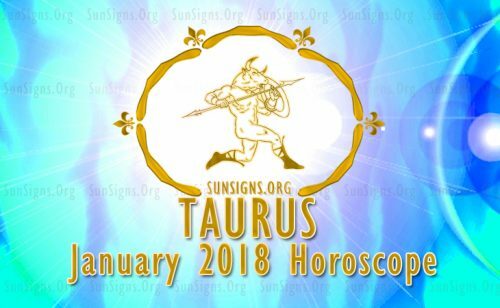 The Taurus January 2018 zodiac astrology predictions forecast that family environment is not very congenial and will be full of strife between family members. You can also look into Taurus sexuality traits. Horoscope 2018 predictions say that you have to be extremely cautious in dealing with family members. Family atmosphere is deeply impacted by the solar eclipse. The eclipse will throw up all the negative aspects of the present family life and will help you to find a solution to rectify the lingering defects. If you are in a relationship, your objective should be to keep the relationship moving in spite of serious differences. Singles will have good prospects of striking a relationship and maintaining it. Pregnancy can be postponed by the bulls this month. Health Astrology is predicting that health of Taurus born will be excellent till the 20th of the month of January 2018 and after that it can be maintained with sufficient precautions. The Taurus January 2018 monthly predictions indicate that career and spirituality will dominate your life this month. You can also see Chinese 2018 Horoscope.